Why Choose Netforchoice Incoming Filter? NetForChoice applies its proprietary self-learning smart technologies to eliminate spam mail before it reaches your network. An extra protective layer of incoming filter to your email flow and infrastructure adds redundancy and continuity to your email delivery process. When the destination mail server is unreachable, Netforchoice filtering systems queue inbound email. With our highly efficient first-level incoming filter defense running in front of your mail infrastructure, you will no longer need to deal with vast amounts of incoming email spam. Choose between our redundant Hosted Cloud or implement the Incoming Filter directly on your Local Cloud hardware. Adding the domain to the destination mail-server and the simple change in mx-records can be fully automated. That's all you need to do! Netforchoice unmatched spam intelligence is a direct result from processing millions of emails every second of the day. Our incoming email filters have an industry leading rate of nearly 100% filtering accuracy with close to 0 false positives. Netforchoice Incoming Filter is fully managed, maintained, monitored and updated by our team and real-time synchronized with our central data bases worldwide. Netforchoice provides pre-built add-ons to fully integrate the Incoming Filter with major control panels and other email collaboration tools (cPanel, Odin Service Automation, Plesk, Direct Admin, ISPsystem and Open-Xchange). Netforchoice delivery queuing adds an extra redundancy level when the destination server cannot be reached. Queued messages are pushed to the destination mail server when reachable again, preventing email from being lost or bounced back to the sender. Queued email can be accessed and read via the web-based interface. Our multi-level central web-interface gives access to different permission levels, branding options, and other functionalities such as automatic user detection, attachment management and white and blacklisting tools. 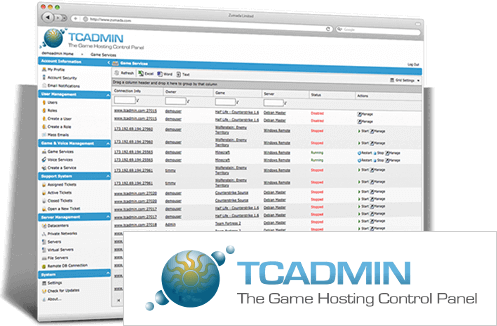 With it's flexible design and powerful features TCAdmin was designed from the ground up to help today's Game Service Provider save time and money, while allowing end users complete control over their servers.